Although this project dates from World Refugee Day 2013, it is still relevant today. World Refugee Day is an annual event organized by UNHCR on the 20th of June. In honor of this day, Stichting Vluchteling (the Dutch Refugee Foundation), started this guerrilla style campaign to shed light on the invisibility of the rising number of refugees. 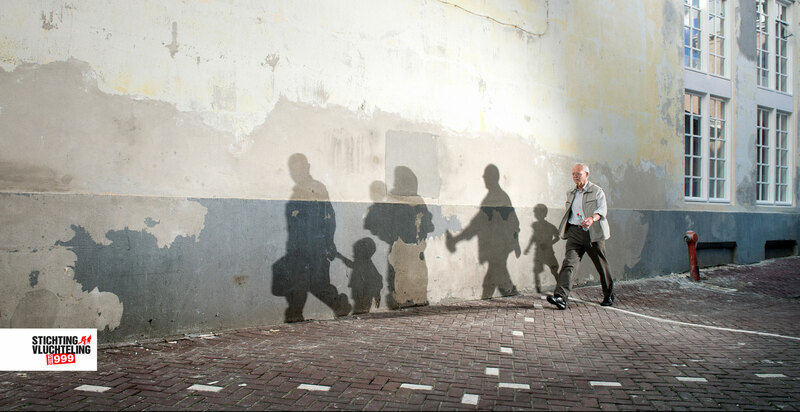 For 10 days, life-sized shadows emerged during the nights, surprising the people of Amsterdam in the morning. This year the unidentified but well-known artist Banksy, recreated the European Union flag. Where the original EU flag uses yellow stars to represent the people of Europe in unity, the Banksy flag uses the bodies of drowned refugees to represent indecisiveness and lack of responsibility by the EU. In this case CEA(R) (The Spanish refugee foundation), used the Banksy flag. The nomadic artist, Joel Artista, has done many mural projects throughout the world. Giving color and means of expression to the most gray areas. In 2013 Artista, Syrian refugees, artists and educators started a collaboration with aptART, ACTED, UNICEF, ECHO and Mercy Corps. Through workshops about water conservation, hygiene, art and conflict resolution, they offered the youth of Zaatari refugee camp in Jordan an intellectual and artistic outlet. Together with the kids and youth of Zaatari, they created many murals. In September 2015, the Dutch art collective: Power of Art, started their guerrilla style project named, Moving People. They created a total of 10,010 little statues, inspired by 10 people who once had to flee their countries. 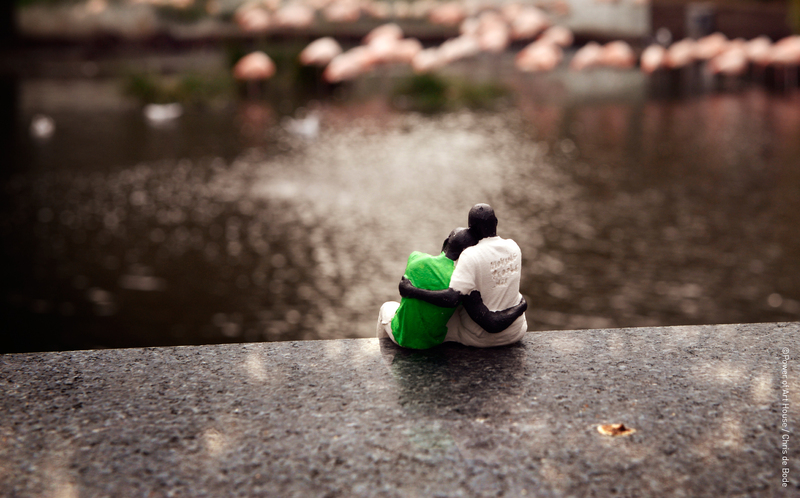 The little statues can be found anywhere in the Hague and Amsterdam. Each statue tells a story, triggering those who find them to look at the human side of the refugee crisis. Encouraging people to take the little statues to new places and send an update on where they are through social media. Resulting in little statues popping up in several countries, including Germany, China, Spain, the US and even in the White House. 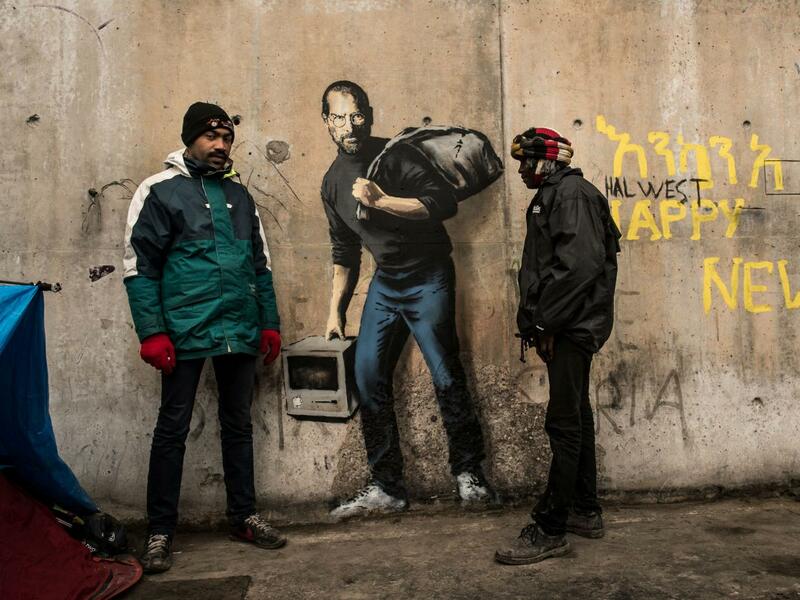 In order to shine a new light on refugees, Banksy created this graffiti portrait of Steve Jobs in the France refugee camp in Calais. Jobs was the son of a Syrian migrant from Homs. The so called Jungle of Calais is nothing new. It came into existence in 1999 under the name Sangatte. It was later closed in 2002 but kept reappearing on different locations in Calais, France. More than 7,000 people from war-torn countries are currently camping in Calais, hoping to reach the UK to start new lives. This is all so fascinating! Thanks for sharing. I love the art murals, the little statues. So powerful. And the info about Steve Jobs – wow! Thank you Deb 🙂 It sure gives a whole other perspective when the current refugee stories are compared to those of a ‘big man’ such as Steve Jobs.. We need wake up calls like those from time to time.. Just to realise that all these refugees are individuals with hopes, dreams and aspirations.